AIER’s Leading Indicators index falls to the lowest level since the recession. Leading indicators fall farther below 50 in March. Jobs growth rebounded in March. The unemployment rate remains near multidecade lows. The number of open jobs remains near all-time highs. AIER's Leading Indicators index falls to the lowest level since the recession. AIER's Leading Indicators index dropped 17 points to 25 in March, the lowest level since June 2009. 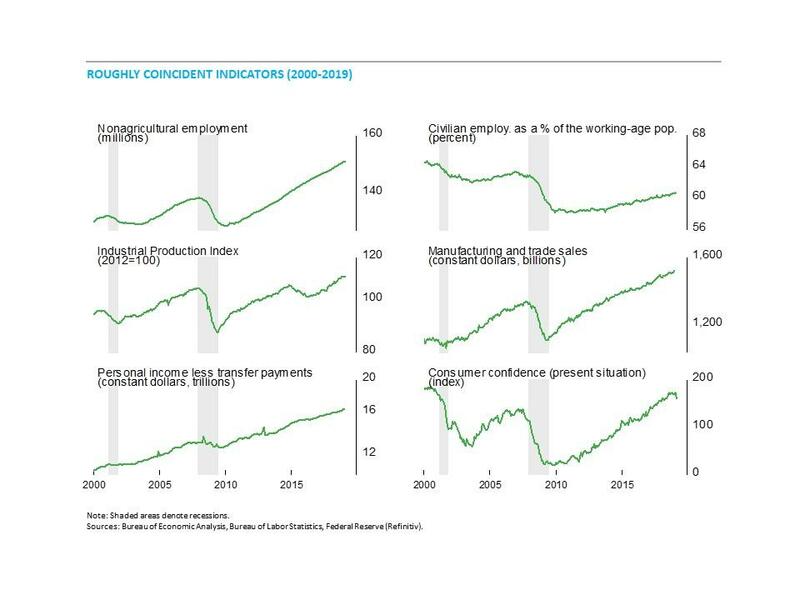 The Roughly Coincident Indicators index and the Lagging Indicators index also fell, to 83 and 67, respectively (see chart). March is the third consecutive month with readings for the Leading Indicators index below the neutral 50 threshold. The duration and severity of the declines justify significant concern regarding the durability of the economic expansion. 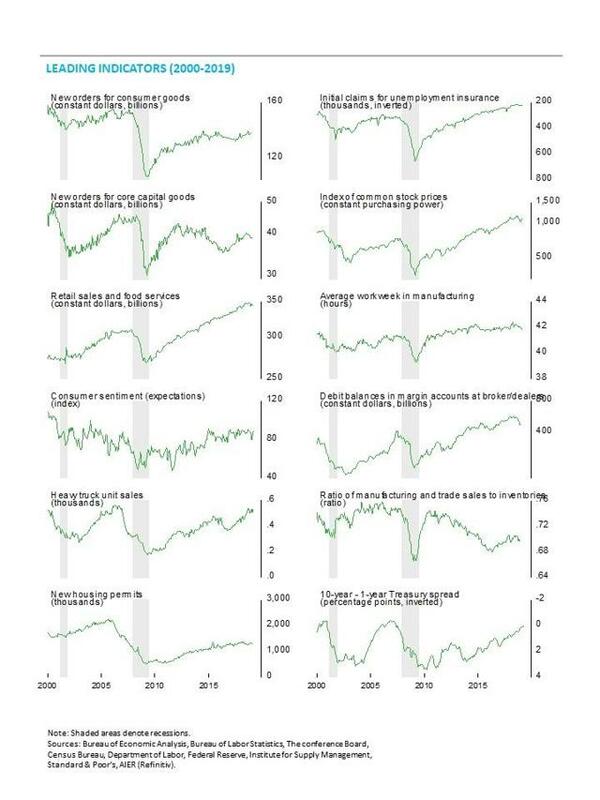 However, while the majority of the leading indicators are trending down, the pace of decline is generally mild, suggesting the path of economic activity may be more similar to a slowdown than a recession. Disruptions to economic activity and ongoing delays in the timely publishing of some economic data used in the calculation of the AIER business cycle indicators, both caused by the government shutdown, further cloud the picture. It will likely take another month or two before a reliable assessment can be made regarding the likelihood of a recession. Note: The recent government shutdown included the Department of Commerce, the source of some of the AIER business cycle indicators. For the March update, 5 of the 24 business cycle indicators remain behind schedule. Caution should be exercised when interpreting the performance of the indexes. The AIER Leading Indicators index fell to 25 in March. The reading is the fourth decline in the past five months and puts the index at the lowest level since June 2009. 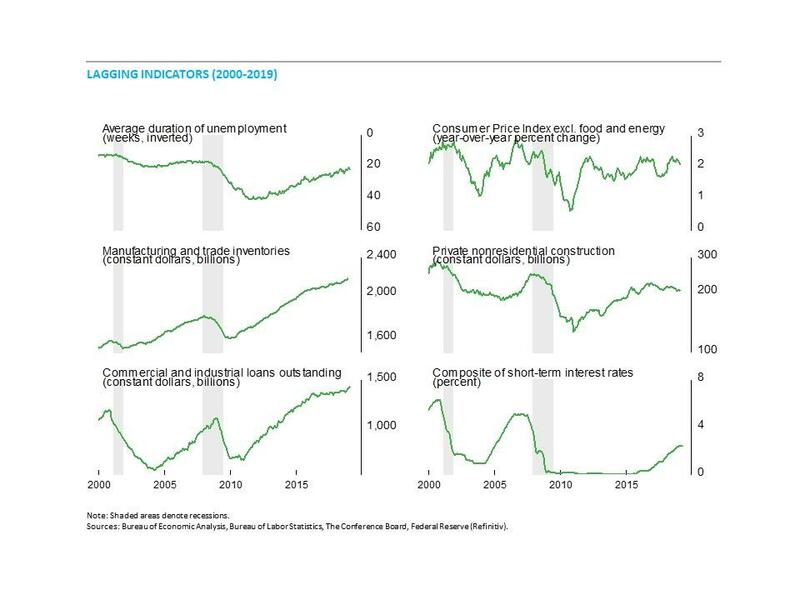 The performance of the indicators is consistent with a broad range of economic data that show a slowdown in economic activity. However, the government shutdown in December and January, which caused disruptions to economic activity, suggests caution when interpreting the index. Among the 12 leading indicators, 2 showed a positive trend in March, with 8 trending lower and 2 neutral. Three indicators worsened in March. The indicator for real retail sales and food services weakened from a positive trend to a downtrend while real new orders for core capital goods weakened from a neutral trend to a downtrend. 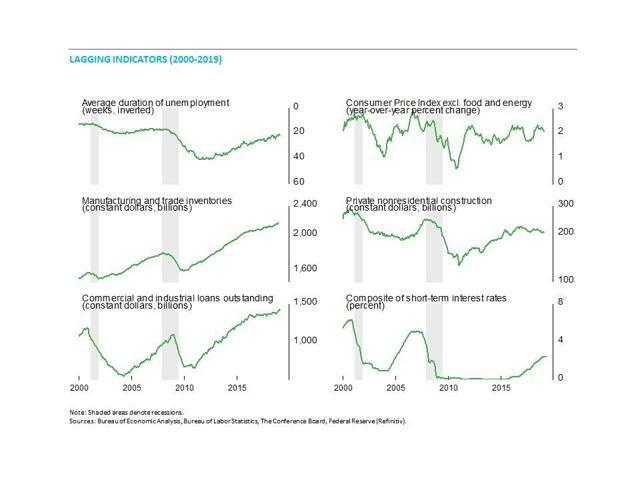 Real new orders for consumer goods moved from a positive trend to a neutral trend. 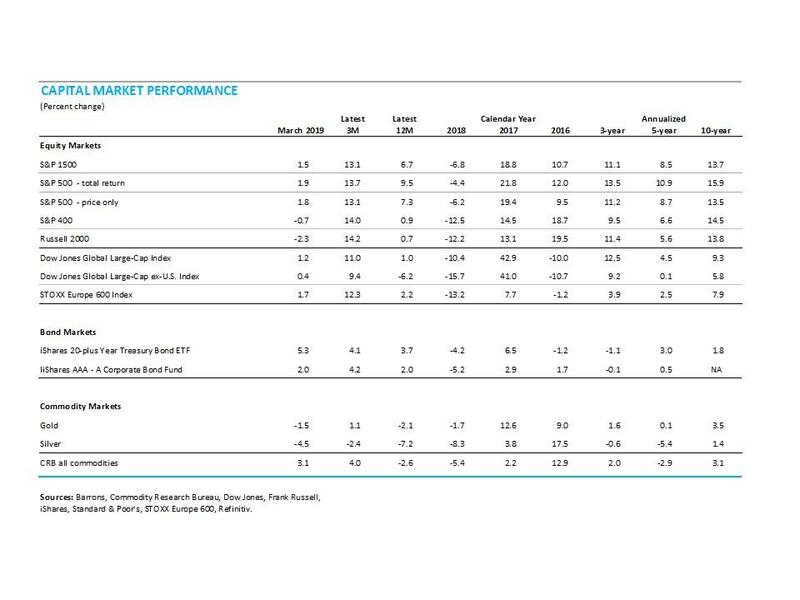 Three of the five delayed data series were leading indicators. The Roughly Coincident Indicators index fell to 83 in March from 92 in February. This index is now at the lowest level since February 2017. The coincident index had been oscillating between 92 and 100 for 24 consecutive months, hitting 92 in 7 of those months and scoring perfect 100s in 17. One indicator, The Conference Board's present-situation consumer-confidence index, changed from a neutral trend to a downward trend in the latest month. In total, five indicators were trending higher in March while one was trending lower. One coincident indicator is currently behind schedule. AIER's Lagging Indicators index also fell in the latest month, posting a reading of 67 in March versus 75 in February. One indicator changed its signal last month. The core Consumer Price Index changed from a neutral trend to a downtrend, leaving four indicators trending higher and two trending lower. One indicator remained behind schedule in March. All three AIER business cycle-indicator indexes fell in March, equaling or lower than the lowest level in at least a year. Some data remain delayed, allowing the effects of the government shutdown to linger in the indexes. 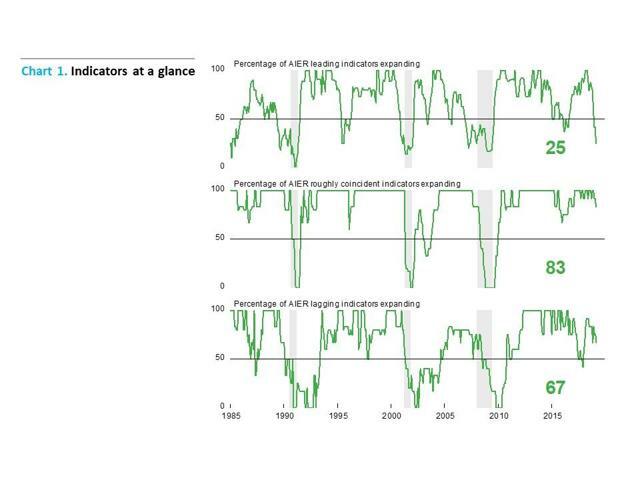 The severity of the decline in the Leading Indicators index justifies significant concern regarding the durability of the economic expansion; however, the mild pace of decline among many of the leading indicators suggests the path of future economic activity may be more similar to the economic slowdowns in 1995 and 2015 than a recession. Two of the three leading indicators that weakened last month were related to the U.S. consumer. With consumer spending making up more than two-thirds of gross domestic product, the outlook for the consumer remains central to the economy. The latest update to the AIER business cycle indicators was based on data available through March 31, including the weak February jobs report. In early April, new data suggest the labor market remains robust. U.S. nonfarm payrolls added 196,000 jobs in March, after an increase of just 33,000 new jobs in February. The modest February gain was revised up 13,000 from an initial estimate of 20,000 jobs. Combining the last two months with a 1,000 upward revision to January, the three-month average gain in payrolls came in at 233,000 in March. For the private sector, nonfarm payrolls added 182,000 in March following a gain of 28,000 in February. On a three-month average basis, private payrolls added 236,000, and over the past year, the average monthly gain is 202,000. The latter average is just above the eight-year monthly average of 200,000. Despite the poor gain in February, job creation returned to a solid trend pace in March. The unemployment rate held for the second consecutive month at 3.8 percent, just above the 50-year low of 3.7. The labor force participation rate fell 0.2 percentage points to 63.0 percent in March as 224,000 people left the labor force. The number of open positions in the economy was up slightly in January to 7.581 million, just below the record-high 7.626 million in November 2018. Private job openings in the United States totaled 6.902 million in January versus 6.860 million in December. The job openings rate, openings divided by the sum of jobs and openings, held at 5.1 percent for the private sector. That is just 0.1 percentage points below the all-time high of 5.2 percent reached in November and December 2018. Further signs of labor-market strength may be seen in the number of quits, which likely reflects confidence in the labor market. Quits totaled 3.284 million for the private sector versus 3.205 million in December. The layoffs rate, another key indicator for the labor market, held at 1.3 percent for private employers, and is consistent with the historically low initial claims as a percentage of employment. Average hourly earnings rose 0.1 percent in March, pushing the 12-month change to 3.2 percent, down from a cycle peak of 3.4 percent last month. Growth in average hourly earnings has been very slow compared to previous cycles, especially given the low unemployment rate, but has been accelerating gradually since late 2017. Combining payrolls with hourly earnings and hours worked, the index of aggregate weekly payrolls rose a healthy 0.5 percent in March and is up 5.2 percent from a year ago. This index is a good proxy for take-home pay and has posted relatively steady year-over-year gains in the 3 to 5 percent range since 2010 but has now been above 5 percent for 11 straight months. Personal income rose 0.2 percent in February. The gain in personal income was supported by a 0.3 percent increase in wages and salaries. Wages and salaries account for about half of personal income. Supplements to wages and salaries (primarily employer contributions to pension and insurance funds and government social-insurance programs) account for another 11 percent of personal income and posted a 0.2 percent rise in the latest month. Proprietors' income surged 0.7 percent for the month following a 1.7 percent decline while income on assets (interest and dividends) decreased 0.7 percent. Personal tax payments rose 0.5 percent in February, leaving disposable income with a gain of 0.2 percent. From a year ago, disposable personal income is up 4.3 percent, just slightly below the 25-year annual-average growth rate of 4.6 percent. The personal savings rate rose to 6.8 percent of disposable income from 6.4 percent in January. A more comprehensive measure of savings is available in the quarterly flow-of-funds data from the Federal Reserve. That measure has typically shown a higher savings rate compared to the measure in the monthly personal-income release. As of the fourth quarter, the personal savings rate from the flow-of-funds report was 11.6 percent. The average over the last three years is 10.4 percent versus a 36-month average of 6.7 percent for the Bureau of Economic Analysis measure. In both cases, savings rates are above pre-recession levels but still below the rates of the 1960s and 1970s. Household net worth dipped in the fourth quarter, falling to $104.3 trillion versus a record-high $108.1 trillion in the third quarter. The decline was primarily due to falling equity prices in the fourth quarter. 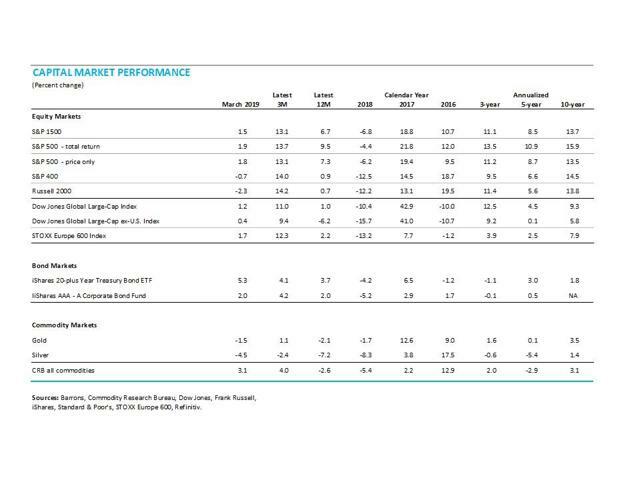 Total financial assets fell 4.4 percent while nonfinancial assets rose 1.0 percent. Total liabilities rose 0.8 percent for the quarter. The combination of falling equity prices and slightly higher debt pushed the debt-to-assets ratio to 13.3 percent from 12.8 percent, but the fourth quarter is still well below the 40-year average of 14.6 percent. In addition, the financial-obligations ratio (minimum debt payments plus other leases and taxes as a share of disposable income) was 15.3 percent for the fourth quarter, well below the 39-year average of 16.4, and at the lower end of the 39-year range of 14.9 to 18.1 percent. The March results from the University of Michigan Surveys of Consumer Sentiment show overall consumer sentiment improved from the February result. Consumer sentiment increased to 98.4 in March, up from 93.8 in February, a 4.9 percent gain. From a year ago, the index is off 3.0 percent. The two sub-indexes had healthy gains in March. First, the current-economic-conditions index rose to 113.3 from 108.5 in February. That is a 4.4 percent gain for the month but still a 6.5 percent decrease from March 2018. The March result is also on par with the 113.5 peak reading from the prior expansion. 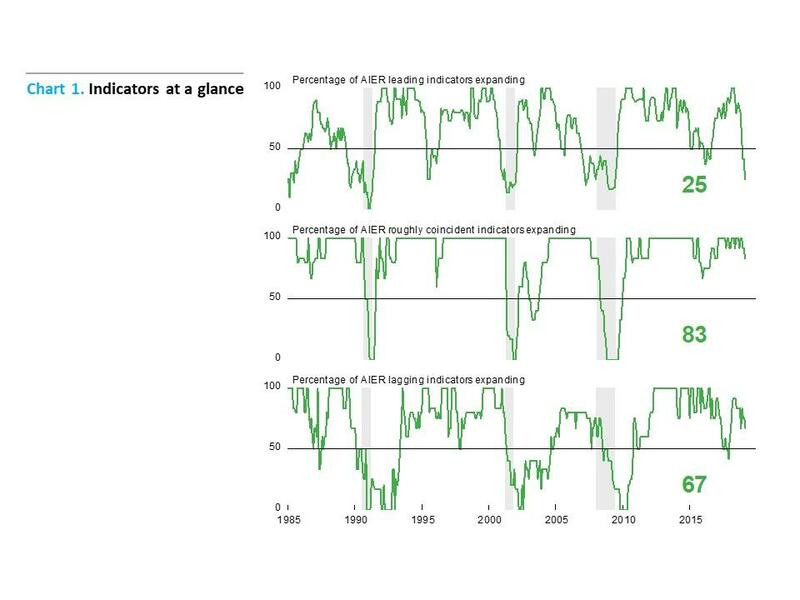 The second sub-index - that of consumer expectations, one of the AIER leading indicators - increased 5.2 percent for the month, to 88.8, the same level as in March 2018. The Consumer Confidence Index from The Conference Board fell sharply in March, decreasing by 7.3 points to 124.1. The March decline follows a nearly 10-point jump in February. Despite the latest drop, the composite index is still at a relatively high level. Both components of the index posted declines for the month. The present-situation component - one of the AIER roughly coincident indicators - fell 12.2 points to 160.6 while the expectations component lost 4 points, taking it to 99.8 from 103.8 in the prior month. The report noted that the recent government shutdown and financial-market volatility have been the primary reasons for volatility in recent months. With the shutdown over and equity markets substantially higher, these numbers are likely to improve in coming months.